Bilberry, not to be confused with the blueberry, is similar to the blueberry, but is smaller and has a livelier taste. Bilberries are more difficult to grow and are rarely cultivated. Wild, they grow in Scandinavia, Scotland and England and in Northern Turkey. Bilberries are darker than blueberries, and its pulp is reddish purple and causes heavy staining of the fingers and lips. World War II Royal Air force pilots consumed bilberries to sharpen their vision for night missions. 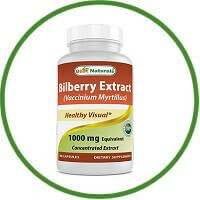 As a convenience, bilberry extract is marketed as a supplement to improve eyesight, night vision in particular. It is available in health stores in capsules, and should be taken supervised by your doctor. Although safe, it does have tannins that with high doses can cause muscle spasms and weight loss. It lowers blood sugar and prevents blood clotting so it should not be taken together with blood thinners. The leaves and fruits of the bilberry plant can also be steeped and crushed in boiling water for tea. Add honey to taste. The effectiveness of bilberry for improving eyesight and night vision is controversial and contradictory. But recent studies have provided evidence that bilberry extracts can inhibit certain eye disorders like macular degeneration.